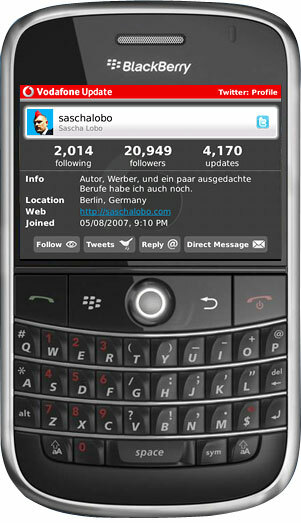 Quick Review: Vodafone Update Twitter/Facebook App for BlackBerry. I decided to give this app a little test drive this morning to see how it compares to Socialscope which also has the advantage of updating both Twitter and Facebook at the same time. How does Vodafone Update hold up? Well, let’s just say that it is a fairly good alternative to Socialscope. The app seems to connect to Twitter and Facebook directly using the api as opposed to how Socialscope has both coming in through their Socialscope servers. The user interface also seems to be very similar to Socialscope’s interface but seems to be a lot cleaner looking in my opinion with better contrast of colors to separate regular updates from mentions. This is one problem I have with Socialscope where you can’t really tell sometimes at a quick glance. Vodafone Update also has better transitions between each section with a really clean swiping animation. Graphically, some of the screens are also better then Socialscopes such as the “user” screen which gives more information about a certain user in a smaller amount of space then Socialscope does.Vodafone Update however does not display images like Socialscope does. It does not show Facebook images or Twitter images. One thing strange about Vodafone Update is that the notifications icon stays in the notification area forever. However, Vodafone Update does have visual notifications even thought the icon stays in the notification tray the entire time. When new updates arrive, the number of updates appears next to the icon. There is even a separate screen that shows you what the updates were, broken down into groups. For example, you would see 20 next to the icon and when you click to check Vodafone Update, it shows you 15 friend updates, 4 mentions and 1 direct message. The only thing it does not have is that it does not flash the LED light upon arrival of new messages. This is one option I wish they would add in the next update. Have I made the switch to Vodafone Update over Socialscope? No. I’m not entirely sold yet on the app as it still is missing some functions that Socialscope has and needs to address a few issues. Vodafone Update also seems to be a battery hungry on my BlackBerry Bold. After using it for a portion of the day, my battery meter is a lot lower then it normally is at this time of the day. 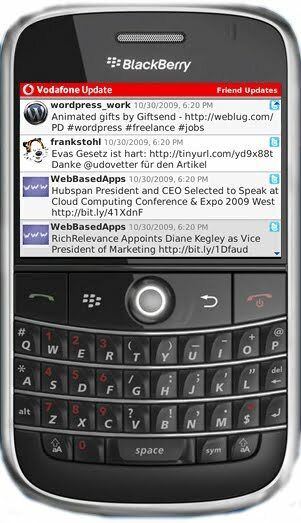 Of speical note is the fact that this app is also available for ANDROID, iPhone, and Symbian/S60 platforms as well. *UPDATE: The battery life can be increased by changing a few of the settings. You can set the amount of time it takes the app to check for updates along with what kind of updates it is actually looking for. Well test out some new setting tomorrow to see what happens.